As self-described science aficionados, Olivia Gavin and Brendan O’Brien are naturals for the robotics program at St. Mary Our Mother School in Horseheads. “I just think that science and problem-solving is really fun. I like to have a challenge,” said Olivia, 12, a sixth-grader. “On my free time I usually play with Legos and read about electronics and stuff like that, how things work,” added Brendan, 10, who is in fourth grade. Olivia and Brendan — along with more than two dozen like-minded students — have achieved considerable success since the school’s robotics initiative was launched last year. Their peak moment occurred Nov. 17, during the 2018 Twin Tiers FIRST Lego League Qualifier. On that day, St. Mary Our Mother’s No. 31494 “Astrobots” squad earned the first-place Project Award in the 17-school regional competition at Corning-Painted Post Middle School. Each participating team built and programmed a Lego robot to complete missions. In addition, they followed the competition’s space theme by performing a project related to a physical problem an astronaut might face during long-term space travel. The St. Mary Our Mother team developed an “Astro-Sink” for washing vegetables in space, according to Bill Neidrich, the Astrobots’ mentor/coordinator. Joining Olivia and Brendan on the winning Astrobot team were Owen Neidrich, the coach’s son; along with Ian Balster, Anthony Barkley, Ginger Curione, James Meritt, Sofia Toribio and Frances Young. To prepare for their November competition, the hard-working Astrobots met two to three times per week, pooling their talents and interests in such areas as mechanics, electronics and computer science. St. Mary Our Mother participates in two versions of the international FIRST (For Inspiration and Recognition of Science and Technology) Lego League. In addition to the competitive program, which is available to fourth- through sixth-graders, students in kindergarten through fourth grade can join a non-competitive junior league. Participants meet most of the school year and engage in a variety of STEM (science, technology, engineering and mathematics) activities, honing their intellectual skills while also enhancing problem-solving, teamwork and communication abilities. 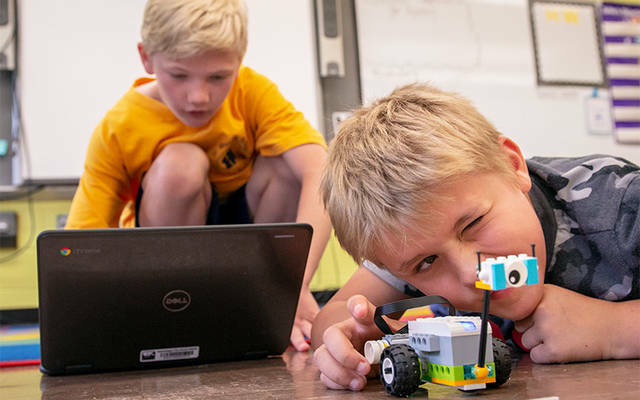 Neidrich said students can opt to engage in a variety of roles corresponding to their interests, noting that some prefer building with Legos, while others lean toward programming; designing posters, buttons and logo designs; or giving presentations. “You can take any student, almost, and find a place for them,” Neidrich said. “I like how everyone’s included. No one’s sitting around doing nothing,” agreed Brendan, who is in his second year with the Astrobots. He said the club is strengthened by the participation of many volunteers: adult mentors Christina Laskowski and Matt Proper, along with five students from the highly successful robotics program at Elmira Notre Dame High School – Emmalie Barkley, John Bernatavitz, Abigail Connolly, Adrian Haluska and Matthew Rilloraza. Then again, Olivia and Brendan can tell you that there’s plenty of enjoyment to be had from coming out on top, as St. Mary Our Mother did with its Astro-Sink project. “I felt really happy and stuff, really excited. Basically, I was jumping for joy,” Olivia recalled about learning that the project had taken first place. Brendan likewise is pretty pumped about the Astrobots’ success in only their second year.